The DPA 5 interface supports light-duty through heavy-duty vehicle diagnostics across multiple platforms including off-highway, agricultural, military and industrial-stationary equipment. 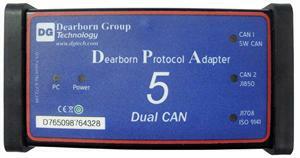 Dearborn Protocol Adapter 5 - Dual CAN, USB/BlueTooth RP1210 A/B/C Compliant, SAE J2534 Compliant. The DPA 5 is a rugged Dual CAN RP1210/J2534 Vehicle Datalink Adapter. 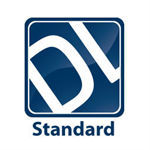 It support many protocols including J1939, J1708/J1587, CAN, J1850 VPW, ISO15765 and ALDL. The DPA 5 has been tested and is compatible with the following application: Allison DOC For PC, Bendix ACOM, Caterpillar ET, Cummins Insite, Detroit Diesel DDDL, Eaton Service Ranger, Freightliner ServiceLink, International Diamond Logic Builder, International Intune, International MD, International Service Maxx, Mack VCADS/PTT, Meritor Wabco Toolbox, ZF-Meritor TransSoft. The DPA 5 comes with a two-year limited warranty. Requirements: Windows Vista, Windows 7 (32/64-bit), Windows 8 (32/64-bit), Works with Windows XP but is not supported. Diamond Logic Builder™ (DLB) provides high performance diagnostics for the electrical systems on high performance International trucks and IC Buses. DLB Fleet displays vehicle signals in graphical and text format.